Immigration has been a hot button topic for decades upon decades. And in the current climate, it seems the battle will continue to be fought for time to come. So the timing of an immigration themed musical couldn't be more perfect. In Manuel Versus The Statue of Liberty, a young Dominican man fights the battle of his life in hopes of living the American Dream. 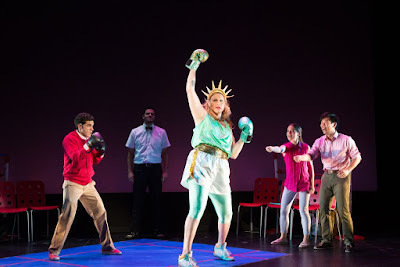 Written by Noemi de la Puente and David Davila, Manuel Versus The Statue of Liberty is inspired by the real life saga of an illegal immigrant of great promise who, despite all odds, fights the powers of liberty in order to be a Princeton student. Infused with Latin, rock, and hip hop, de la Puente and Davila make the conceit a live-action boxing match where Manuel takes on Lady Liberty. The concept is smart. It sets the story apart but the execution of the idea pulls the musical down severely. With a blurry directorial vision and material that needs to be fleshed out even further, the libretto needs assistance. Bouncing around from repetitive boxing moments to realistic book scenes, Manuel doesn't really know what it is. de la Punete makes the factual dialogue preachy and disingenuous. But when the campy nature of the story comes in, it makes the situation easy to laugh at, something the audience will resonate with better. The one-liners prove the value of the campy style. Something that also comes across as false is the ending. Is a happy ending really the way this journey wants to go? Displaying the sad cycle of defeat may actually be stronger. Davila's music is certainly the strongest aspect of this musical. He blends the musical styles seamlessly. There are some outstanding numbers in the show but they couldn't be realized at their full potential as some if the vocals held the strength back. To say the casting of Manuel Versus the Statue of Liberty was perfect would be a lie. Director Jose Zayas turned the piece into something that requires triple threats. What he got was some double threats at best. As the titular characters, Gil Perez-Abraham and Shakina Nayfack were killer actors. In a straight play version, their performances would be star turns. Perez-Abraham had such strong hope and passion. Nayfack is the Diva of Democracy. She certainly proved how fierce liberty personified cane be. But they both lacked the full power Davila desired in his score. Perz-Abraham as a rapper was brilliant but he struggled with the belt. The rest of the ensemble were certainly capable performers but when dancing or singing wasn't there forte, they stuck out like a sore thumb. Of everyone in the cast, the only true triple threat was Anthony Chan. Give this guy his own show! Decisions in the director's seat caused some clarity issues. With the boxing ring conceit designed by Jason Simms taking prime focus, anything that strayed from this looked messy. Zayas and Simms kept six chairs present in front of the ropes which stylistically threw off the feel of the fight. Zayas began his staging with the ensemble remaining on stage but that concept disappeared quite quickly. With the book jumping styles, Zayas seemed to just be lost in how to present the material. Costume wise, designer Lux Haac’s shining moment was the Statue. It was gorgeous and allowed Nayfack to stand as mightily as Liberty herself. There is promise in Manuel vs the Statue of Liberty but until it picks a singular journey, it will continue to suffer from being mediocre. Like the Statue of Liberty, give it time to settle into beauty.